2. Blitz the nuts in a food processor until coarse then tip into a bowl and stir through the signature spice. 3. Lightly grease a 34 x 24cm tin with the melted butter. Gently unfold the filo and cover with a damp tea towel to stop it cracking. 4. Layer sheets of filo in the tin and brush each layer with melted butter. After 4 layers, scatter over half the nut mixture, repeat with 4 layers of filo, then the rest of the nuts. Top with the last 4 layers of filo then generously butter the top. Cut into 24 square shapes with a sharp knife – ensure the blade goes right to the bottom. 5. 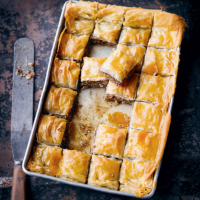 Bake on the middle shelf of the oven on a hot baking sheet for 30–35 minutes, or until golden brown and crisp, reducing the temperature to 170°C, gas mark 3, if the baklava looks as though it is browning too quickly. 6. Remove the baklava from the oven and spoon half the cooled syrup over the top. Leave for 5 minutes then spoon over the remaining syrup. Allow the baklava to cool slightly before removing with a palette knife.